Art of Dentistry supports National Diabetes Month by raising awareness of the link between diabetes and untreated oral health issues including gum disease. Drs. 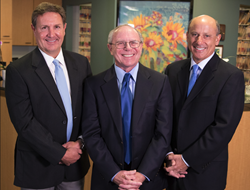 Lawrence Addleson, R. Douglas Campbell and David Landau now accept new patients with bleeding gums and other symptoms of gum disease in San Diego, CA, for consultations without a referral. The trusted dentists and staff at Art of Dentistry support National Diabetes Month by raising awareness of the connection between untreated oral health issues and diabetes. Patients with bad breath, inflamed or bleeding gums and other symptoms of gum disease in San Diego, CA, are now welcome to receive consultations, without a referral, from Drs. Lawrence Addleson, R. Douglas Campbell and David Landau. Gum disease is one of the most common oral issues—affecting millions of Americans—but its negative health effects are not limited to oral tissue alone. Studies have shown a troubling link between advanced gum disease and other systemic health conditions, including diabetes. If left untreated, the infection in the gum tissue can spread to other areas of the body. Drs. Addleson, Campbell and Landau urge patients to take the opportunity to improve their oral health and decrease their risk of developing or furthering diabetes by receiving gum disease treatment during National Diabetes Month. The experienced doctors offer minimally invasive laser gum surgery to patients with bleeding gums, swollen gum tissue, persistent bad breath and other common symptoms of gum disease in San Diego, CA. Laser gum surgery is a popular treatment for periodontal disease, largely because of its minimally invasive nature. Laser treatments differ from traditional treatments in two major areas: they do not use scalpels to cut gum tissue and they do not use stitches to seal the treatment site. Instead, highly concentrated laser light is used to smoothly cut through infected gums with minimal trauma to the surrounding, healthy area. Stitches are not needed to seal off the treatment site because the laser light cauterizes the tissue and causes a clot to form quickly. This prevents bacteria from entering the site and facilitates a quicker and less painful recovery. Patients with bleeding gums are encouraged to find out more about the benefits of gentle laser treatments for gum disease in San Diego, CA. To schedule a consultation with Drs. Addleson, Campbell or Landau, individuals are invited to call Art of Dentistry at 619-291-4325 or visit http://www.sandiegoartofdentistry.com.